We check in to one of the Gold Coast’s original 1950s beach motels and find a low-key holiday vibe that’s MIA in many new hotels. I’m not old enough to know what holidaying on the Gold Coast was like in the 1950s but my grandfather, when he was still here, had many happy stories. They were simple holidays from a simpler time – before having an on-site barber and barista became prerequisite for a hotel’s success. Instead, it was boom time for motels. The vibe was laid-back and small-scale – increasingly the style of accommodation travellers are seeking out more than 60 years later. My soft spot for cute beach shacks is what’s brought me here to Bilinga, a ‘never-heard-of-it’ suburb between Currumbin and Coolangatta. 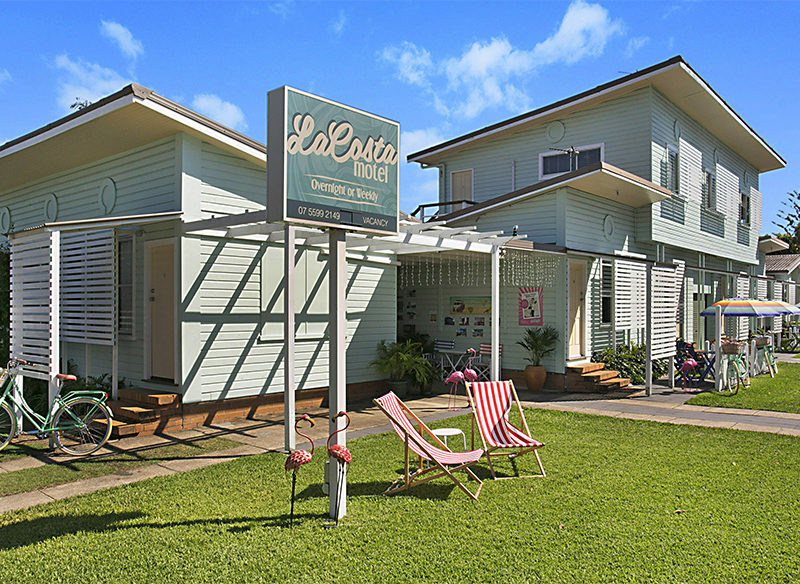 On an unassuming corner, 50 metres to the beach and a five-minute drive from Gold Coast Airport, La Costa Motel is in prime position for exploring the relaxed southern end of the coast. And it’s not just the aqua weatherboard exterior, beach umbrellas and cruiser bikes leaning against a white picket fence that gives this motel soul. When current owners John and Diane Cartmill purchased La Costa in 2001 the idea was to knock it down and build anew. Instead, the global financial crisis forced them to reassess their plans and throw their backs into renovating the ol’ girl. And oh, I’m so glad they did. I almost feel as though I’ve taken a trip in the DeLorean back to 1955 – to a land of pink flamingo garden stakes and original neon light-box signage. While I’m checking in, Diane tells me they only really knew the age of the motel once they discovered old Women’s Weekly and Woman’s Day magazines in the ceiling, dated between 1956 and 1959 – the covers now hang framed in some rooms. I’m sharing with a friend so we’ve booked a twin room with single beds, which are clean and comfortable. The interiors were modernised about five years ago – freshened up with white paint, kitchenettes and new bathrooms, while original wooden floors remain underfoot. Little boxes of cereal – just like my grandparents used to buy for us on holidays – provided along with toast, juice and fresh fruit for breakfast add a cute nostalgic touch. However, I can’t help but feel with a little more styling this could move from comfortable to completely covetable. After a restful sleep, we step outside to a postcard-perfect scene: the sun is shining, locals return from their morning beach stroll and another guest shakes open his newspaper to read over a cup of coffee. If only Grandad could know his favourite holiday haunt can still be enjoyed like it’s 1955. 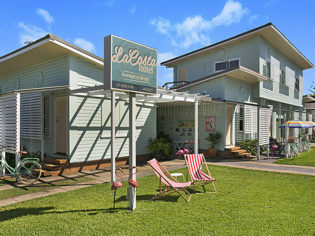 Affordable beachside accommodation with real retro soul, perfect for exploring the southern end of the Gold Coast. Being able to chat with Di about the history of the motel and checking out the old photographs is a real treat. Some of the soft furnishings to feel more ’50s fabulous – but only if we’re being picky. We paid $130 for one night. Wi-fi, breakfast, bike hire and airport transfers included in rate.